The First Cemetery of Athens was founded around 1837, when Athens was also established as the capital city of the modern Greek state (1834). It spreads on the slope of the Ardittos hill, close to the Panathinaiko Stadium. The style of the cemetery can be traced to the Romantic period. 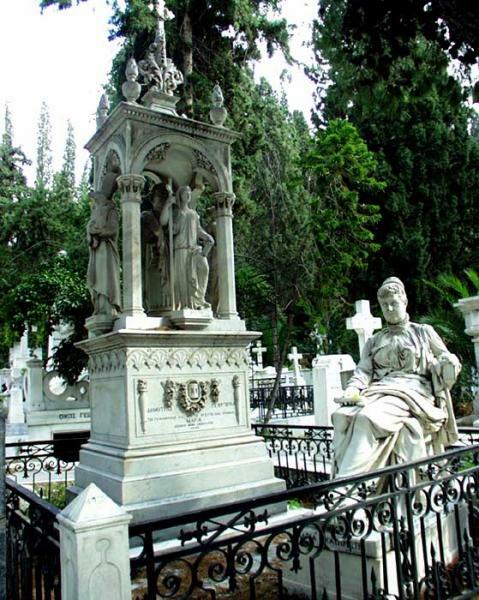 Major Greek figures are buried in the First Cemetery: heroes of the Greek Revolution, politicians, poets, artists. The collection of sculptures hosted in the cemetery can be considered as a most significant and genuine example of the quality attained in marble carving in Greece between 1850 and 1920. Memorial art flourished during the 19th century and marked the rebirth of the new Greek state. All kinds of monuments and ornamental patterns appeared which conveyed the influence of ancient times (stelae, columns, reliefs, sarcophagi, small neoclassical temples). Apart from funerary artworks based on ancient models, some samples can be found of Byzantine and Egyptian patterns, as well as a remarkable number of copper masterpieces. Oglejte si The Cemetery of Athenes na večjem zemljevidu.